At first I thought it was just the quality of my music library and/or the price you pay for MP3 compression – most of my files are VBR V2 quality. But then I noticed the same issue on newer 320K MP3s and (according to all reports) there should be no perceptible difference in audio quality at these high bit rates. Further, playing the same files from the same source sound much better on the XBOX 360 in dashboard mode (same xbox, same amp, same speakers). It is worth noting that in dashboard mode, the XBOX 360 generates a DD 5.1 signal as opposed to PCM signal in extender mode. My XBOX is connected to the reciever via an optical digital connection. So whatever the problem is, its obviously some limitation of the extender architecture. Seems I am not the only one to notice either. Others on the net have noted low volume and low music quality on the XBOX 360 in extender mode. The good news is I may finally have a solution. While trying to solve these issues I ran into a upnp AV server called Asset. 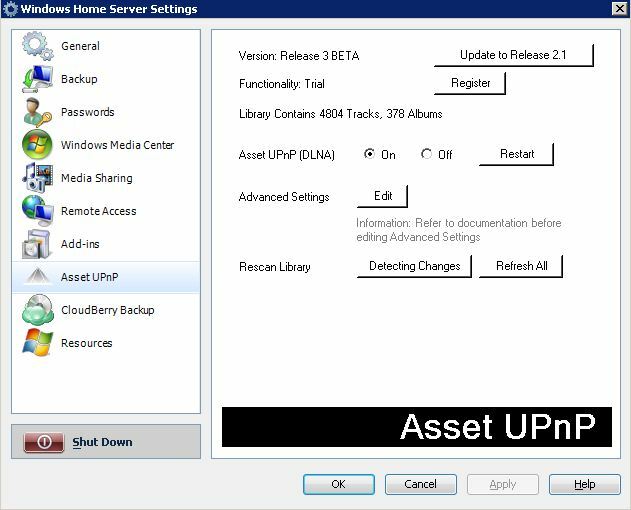 A upnp AV server is just some software that can stream media to upnp compatible clients or devices. 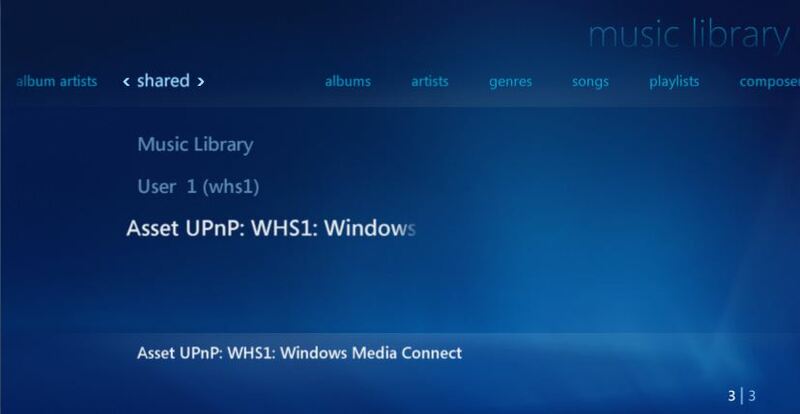 The XBOX 360 in dashboard mode is one such device and can connect to a upnp server for music and video. Usually, this would be a Vista/7MC/WHS machine but you can substitute Asset or another upnp server like Twonky. The cool thing about Asset is that it will automatically transcode FLAC files into a format that XBOX 360 can recognise on demand so FLAC files play just fine. Thats all well and good but my issue is trying to play FLAC files on an XBOX 360 in media center extender mode. How to get 7MC to connect to the Asset upnp server? Turns out its quite simple. One of the menu items in Music Library mode is “shared”. This was something added in 7MC and until recently, its purpose had been a mystery to me. Clicking on it, causes 7MC to find all upnp servers on the LAN – including Asset. Select the Asset server and the album covers are displayed. You navigate the media as a standard music library. And yes, FLAC files will be transcoded on the fly – just like in dashboard mode – and the sound quality is just wonderful! The only issue I have found with 7MC and Asset V3 beta is sometimes album covers are “slow” to display. Upnp clients negotiate media formats with the server and Asset offers WAV and LPCM in additional to the original file format. It seems 7MC negotiates LPCM or WAV always (even if the source is MP3). 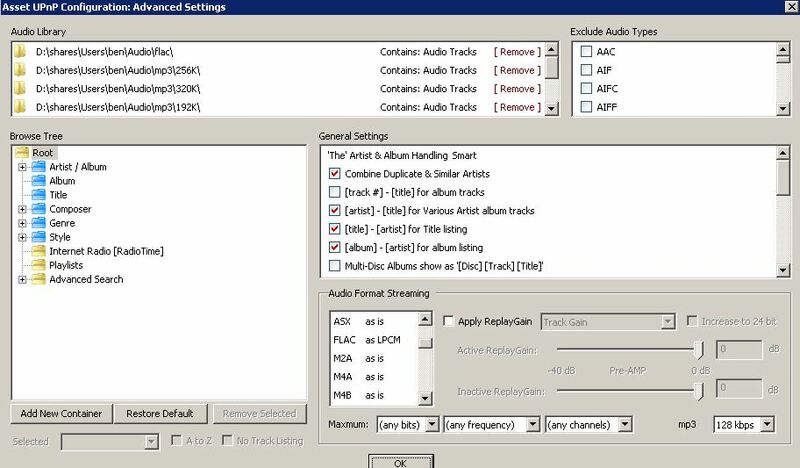 You can however force Asset to transcode to MP3, WAVE or LPCM on a per file format basis via the advanced settings screen. Most interesting is even my old MP3 encoded files sound better from Asset. I suspect this is a side effect of the format negotiation of upnp and a result of Asset doing the MP3 decoding (rather than 7MC or 360). This leads me to beleive that my original sound quality issue is caused by 7MC/WMP12’s builtin MP3 decoder and/or some audio mangling happening with the extender audio protocol with MP3 files. Asset uses the LAME decoder and I have so perhaps the Microsoft MP3 decoder (in the 360 or Windows 7) just isn’t as good as LAME. Asset v3 beta and is currently available for free download at http://forum.dbpoweramp.com/showthread.php?t=19807. The premium version is US$26. Just moved over to Sydney from the U.S. and brought my xbox with me… previously I just had a computer plugged directly into my sound system but I’ve been trying to “tidy up” without looking like everything is from a high school hackers basement in my living room. And wanted to see if you have a had any updates since then before I give this a shot. I no longer use the Xbox 360 to stream music as it’s just not very good at it. See my article here. 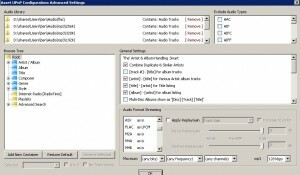 The Xbox 360 insists on converting all audio sources to 48 kHz even if the source is 44.1 kHz. In the process it stuffs the quality. For most listening on a TV the difference is not noticeable but when connected to a good AMP and speakers, its horrid. Instead I now use the WD TV live to stream audio from my server. The WD TV live is very cheap and does a great job of streaming audio and video from a local drive or from a uPnP AV server or just a plain file share. Flac, MP3, DTS it doesn’t care. The Xbox is still in the living room but now its relegated to being a Media center extender for live and recorded digital TV only. I will probably replace it with a FetchTV soon with Internode but don’t want to lose the flexibility of watching a record program anywhere in the house.